Find a few good containers to use. You can use many different types of containers, including clean yogurt cups, peat pots, peat pellets, plastic pots, and plastic trays. Whatever type you use, make sure it has drainage holes and can hold at least a depth of 3 to 4 inches of seed-starting soil. Add 3 to 4 inches of seed-starting soil to each container. Seed-starting soil is specially formulated to help young seeds grow easily. Avoid heavy potting soil mixes and garden soil; they can compact, making it hard for young roots to grow, and garden soil may contain harmful diseases that could attack the plants. Moisten the seed-starting mix before putting it into the containers. Sow your seeds into each container. Follow the directions on the seed packet for how many seeds to sow per container and for how deep to sow the seeds in the soil. For each container, use a permanent marker to write the name of your seedlings and the sowing date on a plastic or wooden plant marker and stick it in the soil. Cover your containers with a plastic sheet and place them in a warm location out of direct sunlight. Check for germination every few days. After the seeds start to germinate, give your seeds some light. Remove the plastic cover and place the containers under artificial lights. Commercial full-spectrum grow lights are best, but you can use a simple fluorescent shop light with one cool white bulb and one warm white bulb. 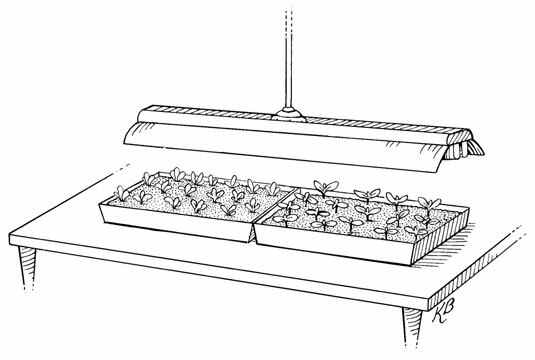 Place the lights only a few inches from the top of the seedlings and move them up as the seedlings grow. Use a timer to keep the lights on for 14 hours a day. After the second set of leaves has formed, thin your seedlings to one per small container by snipping out the extras with scissors. Keep the soil moist but not soggy, or your seedlings may get diseased and die. Fertilize with an organic liquid fertilizer, such as fish emulsion, as directed on the bottle, starting after the second set of leaves form. Keep the plants growing strong until one week before you plan to transplant them outdoors. Before transplanting the seedlings outdoors, harden off the seedlings. If you’re growing large plants, such as tomatoes, and you started with small containers like yogurt cups, you may need to transplant the seedlings into larger pots before transplanting them outdoors. After the height of the seedlings is three times the diameter of the pot, transplant them into a pot one size larger.